As one of the powers of world football, it’s safe to say that the 2018/19 season has been a disaster for Real Madrid. Whilst the loss of Cristiano Ronaldo was a huge blow, many fans and pundits alike expected them to still compete on all fronts. Unfortunately for Madrid fans, that just hasn’t been the case this season. They currently find themselves in 3rd place in La Liga, 12 points behind arch-rivals Barcelona. Their Champions League campaign was also a disaster as they conceded 4 goals at home to Ajax to bow out in the Round of 16. To round out this poor trifecta, they also suffered a 4-1 aggregate defeat to Barcelona in the Copa Del Rey. With Former Manager Zinedine Zidane back in the fold, Real Madrid are expected to be huge spenders in the Summer Transfer window. They are particularly in the market for a strong forward to help replace some of Ronaldo’s production. Without further ado, let’s look at 5 players who Madrid could bring in this Summer. After years of speculation, an Eden hazard transfer to Real Madrid looks imminent. Chelsea reportedly want 100 million Euros for their star man, whilst Madrid are said to have bid as much as 82 million. 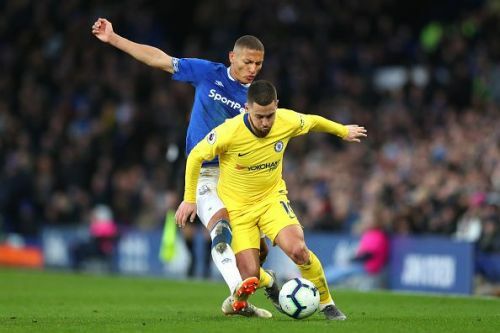 On paper, Hazard would be an excellent fit for a Madrid squad lacking offensive production up front. Karim Benzema has continued to underwhelm as the #9, whilst Gareth Bale has had yet another disappointing season. Ever since arriving at Stamford Bridge in 2012, Hazard has been among the league’s premier forwards. He has scored double-digit league goals in 5 of his last 6 campaigns and is regularly among the Premier League assist leaders. Given their recent form of late, Chelsea also look in real danger of missing the Champions League again next season. Should that occur, I think Hazard is very likely to be on his way to the Bernabeu.